Awarded annually to a graduate or graduates over age 40 who have demonstrated remarkable achievement in the previous year. 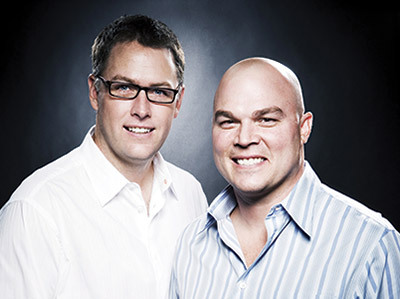 Michael Brandt’s and Derek Haas’s willingness to share what they’ve learned in Hollywood has informed future plans for Baylor Film and Digital Media, and their advice has led to the formation of tailored classes and other opportunities to prepare students for the rigors of the industry. We honor their significant contributions through the presentation of Alumnus of the Year Awards. For a variety of reasons, partnerships in Hollywood tend not to last. Sometimes, it’s as simple as different opportunities; other times, artistic differences, egos or money get in the way. This makes it all the more notable when a partnership works—particularly one that produces five feature films, a television movie, a video game and two current hit TV shows — a body of work shared by Michael Brandt (BBA ’91, MA ’94) and Derek Haas (BA ’91, MA ’95), two friends whose working relationship has taken on the quality of iron sharpening iron. Brandt credits Baylor Film and Digital Media for altering the course of his life. Baylor was at the forefront of what was then new technology, non-linear editing, which replaced physical film cuts with digital, computer-generated edits. Being able to learn Hollywood’s next big thing before many in Hollywood had even grasped it gave Brandt a marketable skill that took him to California and connected him with directors like Robert Rodriguez and Quentin Tarantino. That ability opened the door for him to serve as the primary editor or in the editorial department for a number of films. Haas, a journalism and English major, knew writing was going to be a major part of his life. However, he didn’t initially know his passion would lead to screenwriting. While he took plenty of film classes at Baylor, he dreamed of writing “the great American novel.” Amidst the rigors of television and film, he’s found time to pursue that passion, writing a trilogy of thriller novels: “The Silver Bear,” “Columbus” and “Dark Men” between 2008 and 2011, before releasing “The Right Hand” last year. The NBC television series “Chicago Fire” and its spinoff, “Chicago P.D.,” are the two latest collaborations by Brandt and Haas, whose nearly 20-year partnership was formed in a screenwriting class at Baylor University. In the past 11 years, they’ve written five movies. The first, “2 Fast 2 Furious,” came in 2003. “Catch That Kid,” “3:10 To Yuma,” “Wanted” and “The Double” followed. In the years since they made it in film, the two have faithfully shared their expertise with Baylor Film and Digital Media students. As a result, more Bears are making their mark in Hollywood and increasing Baylor’s profile there. After launching a photography business soon after graduating, Katie Jenkins Norris discovered her calling to use her talent to give back to others through her nonprofit, Fotolanthropy. We honor her contributions and service through the presentation of the Young Alumna of the Year Award. 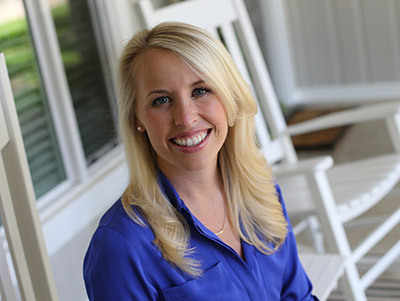 Katie Norris (BSFCS ’08) always knew she wanted to make a difference with her career and found Baylor to be the perfect university to help shape her direction. She credits her studies in interior design for developing the diligence and attention to detail needed to realize her vision. Within weeks of marrying in 2008, Katie and her husband, Reece Norris (BBA ’03), decided to leave their promising careers to pursue their entrepreneurial aspirations. Photography had been a passion in college, so Katie started a professional photography business, Katie Norris Portrait Arts. She had a garage sale in order to buy her first camera and rented her first lens for six months because she couldn’t afford to buy it. In 2011, Katie felt called to use her gift of photography to give back to others and to start a nonprofit organization. Together with Reece, with whom she’s always shared a deep appreciation for true stories, Katie developed the concept of Fotolanthropy. The couple would combine film, photography and philanthropy to document the inspiring true stories of people overcoming adversity. Any Fotolanthropy subject would receive a portrait session, coffee table book or album, short film and a platform to share their story. Thus far, Fotolanthropy has completed 15 stories and nine short films. Six of those have involved Baylor families. The project that has received the most attention is Fotolanthropy’s first feature-length documentary, "Travis: A Soldier’s Story." In addition to running Fotolanthropy and her portrait business, Katie founded and designed the Fotostrap, a high-quality camera strap, with 10 percent of each sale benefiting Fotolanthropy. The Bagby, a green and gold strap, was created to honor Baylor. Like many students, Katie did not instantly discover her calling upon setting foot on Baylor’s campus as a freshman. She hopes her story encourages others to dream big and pursue their aspirations.